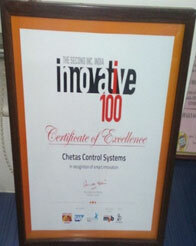 CHETAS has won the UDYOGSHREE AWARD and the function was held at Mumbai on 05.04.2011. 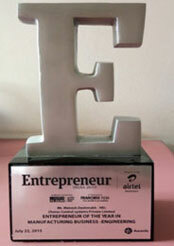 The award was given at the hands of Mr.Subhash Dandekar, President of CAMLIN Industries to Mr.Mahesh Deshmukh. 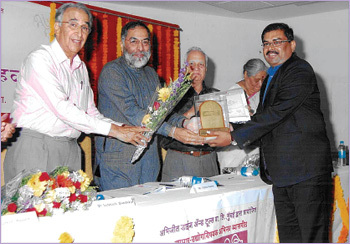 Mr.Vitthal Kamat, Mr.Bheemashankar Kathare were present among the dignitaries. 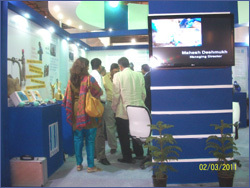 CHETAS participated in the AQUATECH INDIA 2011 at Goregaon, Mumbai from 02-March to 04 March 2011. 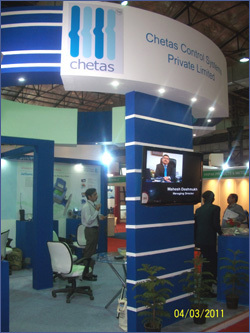 Chetas received overwhelming response from the representatives of Industry, Municipal Corporations and Water Supply Boards across the country. 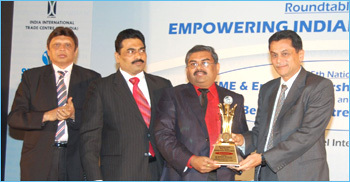 Indian Young Entrepreneurs Forum and Small & Medium Business Development Chamber of India (SME Chamber of India) Jointly organised Best Young Entrepreneur Awards on the occasion 15th Foundation Day of SME Chamber of India on 9th July 2010 at Mumbai. Mr. C.B. 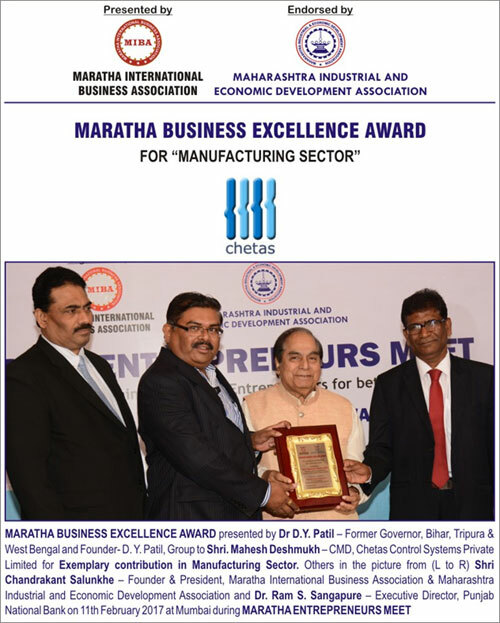 Bhave - Chairman, Securities & Exchange Board of India (SEBI) presenting Best Young Entrepreneur Award in Manufacturing Sector to Mr. Mahesh S. Deshmukh - Chairman & Managing Director, Chetas Control Systems Pvt. Ltd.. (Others from left to right) Mr. Hemant Shah - Chairman & Managing Director, Ackruti City Ltd., Mr. Chandrakant Salunke - President, SME Chamber of India and Maharashtra Industrial and Economic Development Association (MIEDA). 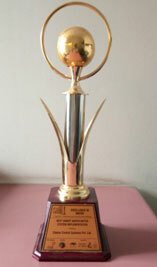 Recipient of the prestigious Parkhe Industrial Merit Award for the year 2006 instituted by The Maratha Chamber of Commerce & Industries, Pune for successful product commercialization of Ultrasonic Transit Time flowmetering technology for the first time in South East Asia and consequent contribution to water conservation. 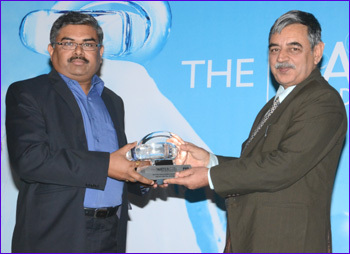 The first Indian company to make Battery Powered Ultrasonic Inline Water Meters with GSM connectivity, which will revolutionize the idea of Bulk Water metering in water distribution networks. 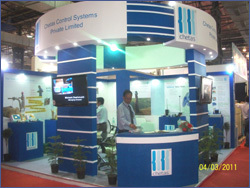 The only company in India to have successfully completed the first ever privatization project of 22000 consumer water metering in the Kalyan-Dombivili Municipal Corporation, which includes supply, installation, 6 year monthly maintenance and 6 year monthly reading & billing of 22000 consumers & similar projects in other municipal corporation in India. 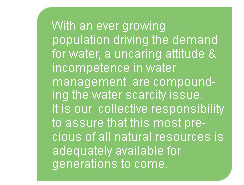 The only company in India to have completed 400,000 installations of domestic & bulk water metering in Municipal Corporations & Water Boards in India. The first enterprise in India to have completed the Rural Watering Metering Project covering 1800 villages in Saurashtra region of Gujarat for the Gujarat Water Supply & Sewage Board. 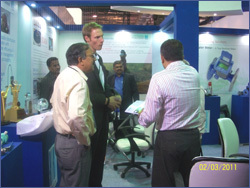 A rich experience of installing and commissioning more than 1000 Ultrasonic flowmeters in India and handling more than 200 Water Auditing cases.